In the genus Pleurotus the stem is attached to the cap at some point to one side of the centre. The stem may be on the very margin of the cap, or may be wanting altogether. The three species to be mentioned all grow on dead wood - either on dead trees or on dead branches of living trees. 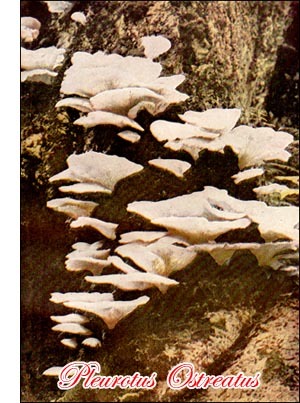 The name Pleurotus comes from a Greek word meaning side, and has reference to the position of the stem.